3rd August 2014: The course is over now. If interested, please contact us for information about future professional development and thinking…workshops. 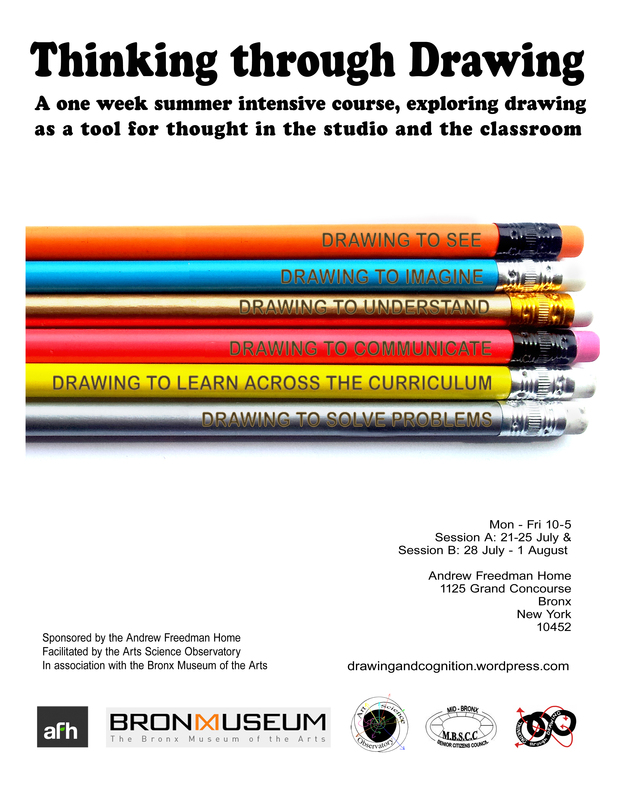 A one-week professional development course in New York City for educators in all disciplines, exploring drawing as a tool for thought and research in the artist’s studio and the classroom. Drawing allows us to play with our thoughts outside the confines of our minds, helping us to think as well as to express ideas. As a tool for thinking and expression, drawing can expand the types of knowledge we create and deepen our engagement well beyond what is available through words and numbers alone. The course is led by three artist/researchers, the founders of the International Drawing and Cognition Research Group, whose work investigates the connections between drawing and cognitive psychology. They have run three international Thinking through Drawing symposia — at Columbia University’s Teachers College, University of the Arts London, and the Metropolitan Museum of Art — attracting artists, educators, and researchers from around the world. Building on new understandings of cognition, learning, and contemporary drawing practices Thinking through Drawing will both enrich your use of drawing and visual communication in your classroom and community and nurture your personal drawing skills and practices. In addition to developing skills to apply in your own classroom or community education project, you will be invited to observe and participate in a Saturday workshop with local families as part of the Bronx Museum of Art’s community programs. (Participation in this community workshop is optional.) The fee of $375 covers 30 hours of class times and all materials. Payment is due upon registration, and all sales are final. Because the activity of drawing allows us to play with our thoughts outside the confines of our minds. Lines and marks on surfaces are ways of having and constructing ideas equally as they constitute ways of expressing them. By pointing to critical and intertwined habits of mind and practice, we may consider how the process of drawing contributes to the creation and construction of important knowledge. Students in schools, if encouraged, use drawing as a means for exploration and discovery across the curriculum. Drawing is a tool of thought and expression which considerably expands the kind and depth of knowledge available through words and numbers alone. An important objective of this course is to encourage and embed drawing practice in teaching across disciplines, as a dynamic and embodied research process. In this intensive practice-based course, participants will have the opportunity to explore and think through many forms of drawing, led by three artist/scholars who investigate interwoven strands of research and practice in drawing and cognitive psychology. Participants will explore drawing, both as a means of teaching and learning in the classroom and as a vital component of their own creative practice and intellectual development. Through active engagement and informed reflection, participants will gain new methods and understandings which will expand their capacity to think through drawing. They will explore many possibilities of drawing for themselves, and learn strategies for introducing these possibilities to their students. Artists, scientists, architects, engineers and others draw to inquire into the world around them, to observe and gather information. They draw to generate, explore and test new and established ideas. They also draw to communicate their ideas and observations to others. In all these ways, the accessibility and diversity of materials that can be used make drawing a very direct externalization and exploration of thought. Thinking through the drawing process facilitates metacognition, thinking about thinking, which is both situated and extended through drawing. Grounding teaching and learning on professional practices brings the real world into the classroom. Moving through a variety of independent and collaborative drawing experiments and exercises, the potential and flexibility of drawing as a tool for learning and discovery will be explored. Topics will include: drawing to see, to imagine, to solve problems, to reflect and to communicate. Course readings, discussions and critiques will complement studio work. Participants will leave inspired by the possibilities and potential to integrate drawing into their ongoing practice, and with specific methods to use drawing as a tool for thought across domains. This strand will engage participants in observational drawing as an attitude; open-minded, unknowing and inquiring. Students will explore generative drawing methods and a slow, detailed way of looking. The course will show how drawing can offer a crucial space to learn how to make mistakes, take risks, leap into the dark, and reflect. Practices will include: Drawing in the dark, drawing with touch, drawing with the eyes, slow drawing, drawing webs, making mistakes and drawing reflections. Students will be encouraged to find ways to track growth and movement, both in themselves, in their engagement with the environment, and in things around them. Students will consider the work their drawings are doing, the questions they ask, and meaning that emerges. The practical project will articulate the relationship between the body and the world, between sensation and interpretation, and how we use perception and action to give meaning to our lives. Drawing from educational theory born in New York City, the course will explore John Dewey’s arguments for action and observation, and the multi-sensory drawing pedagogy of artist and teacher Kimon Nicolaïdes. The course will be rooted in sense-observation and what we can learn from our particular experience, by weaving webs between world (things), eye, hand and world (paper). Practical discoveries and hypotheses will be compared with contemporary scientific findings, to try to identify the nature and power of open-ended practical research processes. The students will build arguments through practice for the intelligence of the hand, and for distributed embodied thought, in the light of their own work, that of contemporary drawing practice, cognitive psychology and enactive philosophy. Drawing process is a microcosm that resembles ways in which we learn. This strand of the course will explore the broader value of drawing as a tool for analogical thinking and meta-learning. To manage and drive one’s own learning is the greatest skill, and these practical workshops will explore drawing process as a source for reflection and inspiration for independent self-directed learning. While teachers often use analogies to explain difficult concepts, the ability to ‘draw’ analogies is often neglected. The capacity to make deep structural analogies, to apply existing knowledge and skills to novel situations beyond superficial similarities, is the capacity to be adaptable and resourceful. Drawing can be a potential source domain for analogical transfer. It includes many skills and abilities of potentially broader value: to devise strategies for testing and refining ideas, to steady and slow the eye and mind, to discern the difference between what we know and what we see, to inhibit distractors (both internal and external), to discern details in relation to wholes, to be receptive and selective to visual information, to devise personal strategies for acquiring and organising (visual) knowledge, to test and revise ideas and understandings, even to ‘draw’ analogies. These abilities and skills are implicit in the act of drawing, but they may not be transferred to other domains unless they are elucidated. These workshops will combine drawing tasks with reflective discussion to elucidate and make apparent the cognitive processes underlying the construction of a drawing. In conjunction with the Thinking through Drawing workshops, participants will be invited to participate in two Saturday family workshops offered to the local community. These workshops, Families Drawing Together, will invite families to use drawing as a way to have fun and to communicate.